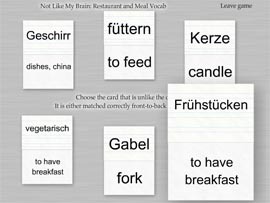 Flash My Brain - Study German with Flash My Brain German flash cards. 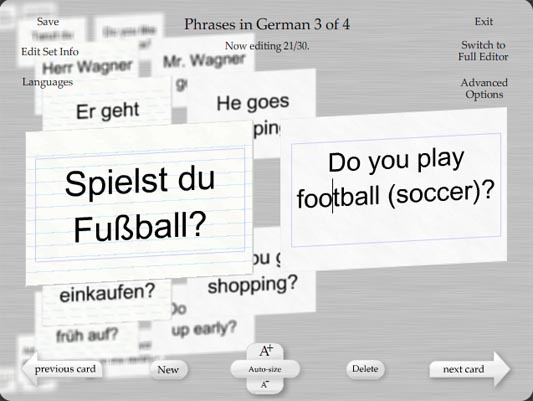 Study German with Flash My Brain German flash cards. 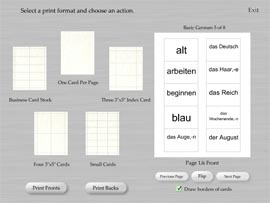 You can print out beautiful German flash cards using the print interface shown at the left. You can print out in a variety of formats for private study or for class materials. When you buy Flash My Brain, you can look forward to selecting and printing exactly the German flash cards you need. Flash My Brain creates and prints beautiful German flash cards, but it doesn't stop there. Flash My Brain has an extensive flash card learning module including games and a natural review interface. With Flash My Brain, you can learn online: at home, at school, or at work. 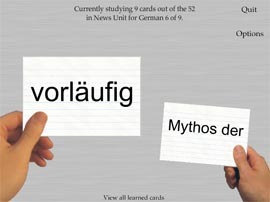 Buy Flash My Brain for $29.95 and start studying German flash cards the Flash My Brain way. Flash My Brain makes learning easier and more fun -- we look forward to seeing you online!